Updated: How does the new iPhone match up to the top Android blower? Whether you love the sound of the new iPhone 5, or massively underwhelmed by the latest Apple smartphone instalment, it's probably going to sell in its millions and have fanboys queuing outside Apple Stores across the world. Available in 'Marble White' and 'Pebble Blue' (pebble... blue?!) and now titanium grey, the Galaxy S3 is sporting a curvier look than the iPhone 5 . It actually looks far less like it's older brother, and actually more resembles of the Samsung Galaxy Nexus, both in size and contours, although the plastic finish on the back feels more premium than its predecessor. Measuring 136.6 x 70.6 x 8.6mm, the S3 is slightly longer, wider and fatter than the S2 (125.3 x 66.1 x 8.49mm), which may prove to bit a little on the large side for some although the extra thickness may actually make the S3 slightly easier to hold and less likely to slip from your hand, particularly when taking a photo. At 133g, the S3 is very slightly heavier than the S2, although only by 3 grams, so it's barely noticeable. The four-inch screen, which we'll come onto in detail shortly, is Apple's belated nod to the industry trend for bigger displays, and means the iPhone 5 now stands a proud 123.8mm tall – width remains the same at 58.6mm. The extra screen real-estate is welcome, though smaller-handed iPhone users might struggle to reach the standby button with a forefinger while holding it in a natural position. They might even have to stretch for the extra top row of apps. Just hold it a different way, perhaps. It's still a lovely and Retina; it now boasts 326ppi and a resolution of 1136x640; it's equally as bright and slightly richer in colour. There's space for a whole extra row of apps – woop! – and tasks can still be performed with one hand. The main benefit is that you can just see more. Web pages are longer, movies are wider, though many we found from iTunes and YouTube still have to be stretched or cropped to fill the screen, the photo viewing area is bigger (just) and Apple's own, optimised apps make good use of the extra space. The S3 one-ups the iPhone 4S and HTC One X on screen size, with an enormous 4.8-inch HD Super AMOLED screen, which displays at a maximum resolution of 720 x 1280. At 306 pixels per inch, the screen is slightly below the quality of the HTC One X and the iPhone 4S but frankly, 306ppi is still eye-searing stuff. Everything that we said about the HTC looking great because of it's size is even more true of the Samsung Galaxy S3. Once again the screen uses Super AMOLED technology, to keep the viewing angle as wide as possible. Low-light image capture improvement was also discussed in the Keynote but we still experienced a fair bit of grain in our testing. The major improvement is with the front camera, which has been upgraded to 720p video, making FaceTime and Skype chats much clearer. Still shots are captured at 1.2MP, so not exactly archive-worthy. The new Panorama mode is intuitive and produces great results. It doesn't capture in landscape orientation, which feels counter-intuitive, but the speed at which it processes and pops out a pretty, panoramic shot is impressive. The rumoured 12MP camera sadly does not make an appearance. Instead the Galaxy S3 arrives with a perfectly reasonable 8MP/1080p camera, exactly the same as that on the HTC One X. In burst mode, the camera takes continuous shots at a rate of 6fps, then picks the best shot based on smile detection, blink detection, contrast and blurring. According to Samsung, the camera also has zero shutter lag along with an improved shot-to-shot time. You'll be able to set up rules for photos to be automatically placed in groups based on faces, contacts or location. There's also Face Zoom which means that you can tap on a face when lining up a crowd shot and the camera will zoom in automatically. The lack of optical zoom means that this is going to be fairly limited, but we look forward to trying it out in the wild. Samsung has put their own quad-core 1.4GHz Exynos processor into the Galaxy S3, and bolstered it with 1GB RAM. The quad-core processor certainly seemed to do the trick in the limited time that we had with the phone. There was barely any lag when switching between home screens and firing up apps. Flash memory is available in 16, 32 and 64 GB versions, improving on the S2's 16GB offering, while there's also a micro SD card slot should you wish to expand the memory. There's also 50GB of free storage for your content on Dropbox for the next years, which is double what HTC is offering on its HTC One X. New phone, new operating system. iOS 6 promises a slightly tweaked user interface with a new look App Store with iCloud support, a smarter Siri that will launch apps, FaceTime over 3G and plenty more. It's still one of the best mobile operating systems and the new features have certainly enhanced its capabilities. If you want to know what we made of the new mobile OS update you can read the iOS 6 review here. The Galaxy S3 comes with Android 4.0 Ice Cream Sandwich as standard. Like HTC, Samsung has taken Android 4.0 and overlayed their Touch Wiz UI - an interface that we already loved from it's Galaxy S2 days. It's been streamlined a little - the wealth of features remains, but things feel a little less cluttered.S Voice is essentially voice-activated control that will give you direct access to functions such as the camera, calls, text, the alarms, weather, calendar and music and it'll even work when music is playing. What it won't do is answer you back with pithy retorts, like Apple's Siri. An Android 4.1 Jelly Bean update is expected to be available from October but it will be interesting to see how it compares to the version we have seen so far on the Nexus 7 and Samsung Galaxy Nexus. 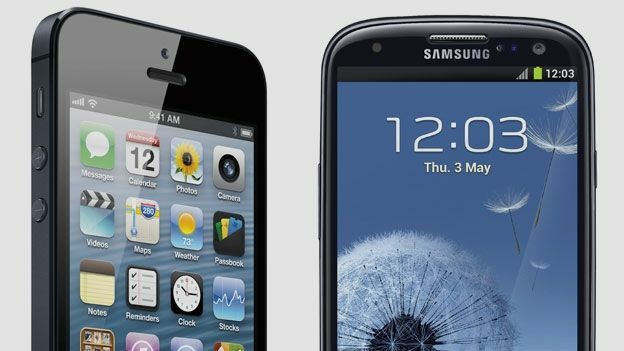 So does the iPhone 5 conquer the Samsung Galaxy S3? Well, we gave the Android smartphone a glowing five-star review and the latest Apple handset just four out of five, which indicates that it's this round to the S3. There's no denying that the iPhone 5 is Apple's best handset to date and while the current Maps issues threatens to put some people off from upgrading, we fully expect the Apple smartphone to still fly off the shelves. The key of course is that many of the new features already appear on Android handsets and the Samsung Galaxy S3 covers most if not all the specs that would usually make the iPhone stand out from the crowd, from the camera, to the sizeable screen and Google's always improving Android operating system. As we said in our iPhone 5 review, It's good, very good. But the iPhone is no longer the best around.